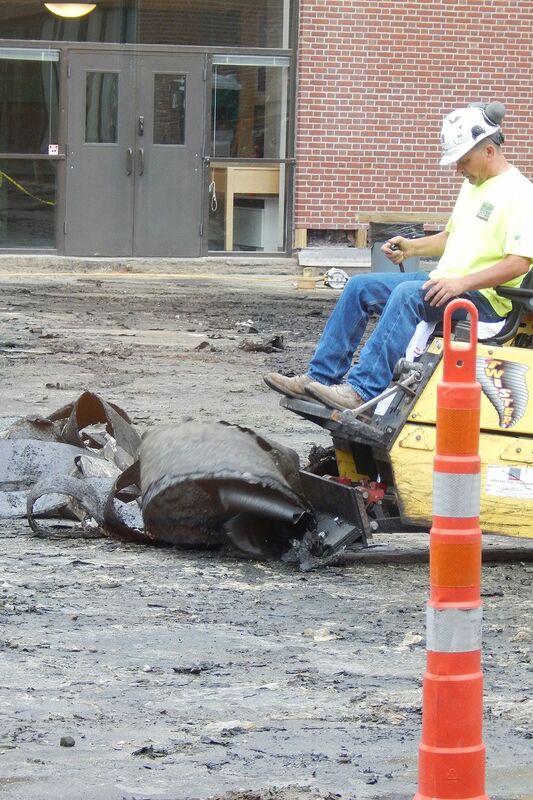 “There’s really an art to concrete,” said Paul Farnsworth, a project manager for Facility Services, as a mess of the stuff oozed like cake batter out of a truck, down a chute, and into forms in front of Coram Library on July 18. A crew from Sundown Construction Inc., a local firm specializing in concrete work, was pouring a frost wall to support a slab that will, in turn, support an extension to the Coram Library porch, facing the Historic Quad. 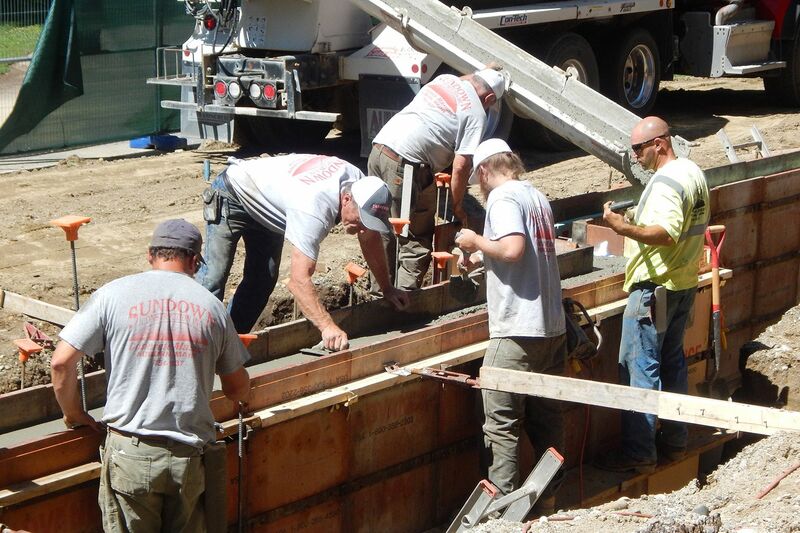 The truck discharging the concrete was one of three that day scheduled to deliver, in total, 30 cubic yards. Although cakes have been served that might suggest otherwise, concrete and cake batter are not exactly the same thing. Still, success for both depends on a precisely executed recipe. In the case of the building material, the ingredients are gravel, sand, water, and cement. Cake can turn hard because it dries out. But not concrete: Instead, through a chemical process called hydration, the water actually bonds with the cement to create concrete’s rock-like durability. We watched as the Sundown crew inserted a vibrating rod into the batter — sorry, concrete — to dispel air bubbles that would weaken it. That’s something that needs to be done but can’t be overdone: If you vibrate your concrete too much, you could force water out of the mixture to the surface, compromising the chemical bonding and thus the quality of the finished material. A representative of the regional engineering firm S.W. Cole also had concrete quality in mind. He took core samples of the mixture to be tested as it cures, which is a relatively gradual process. Cole will strength-test the cores at seven, 14, 21, and 28 days. In this case, “strong” means capable of withstanding at least 4,000 pounds of pressure per square inch. Cole is no stranger to Bates. The company’s tracked, self-propelled drill rigs have appeared on campus a few times during the past year, taking test cores of soil at both the Coram site and, closer to home (ours), here on the outskirts of Bates Communications Plaza, where a science building is slated for construction. Something else we took away from the concrete pour was a possibly surprising instance of concrete industry jargon. Farnsworth pointed out panels of stiff foam insulation whose role was sculptural, not thermal. Placing the panels around the tops of the plywood forms served to mold ledges into the frost wall inside and out. 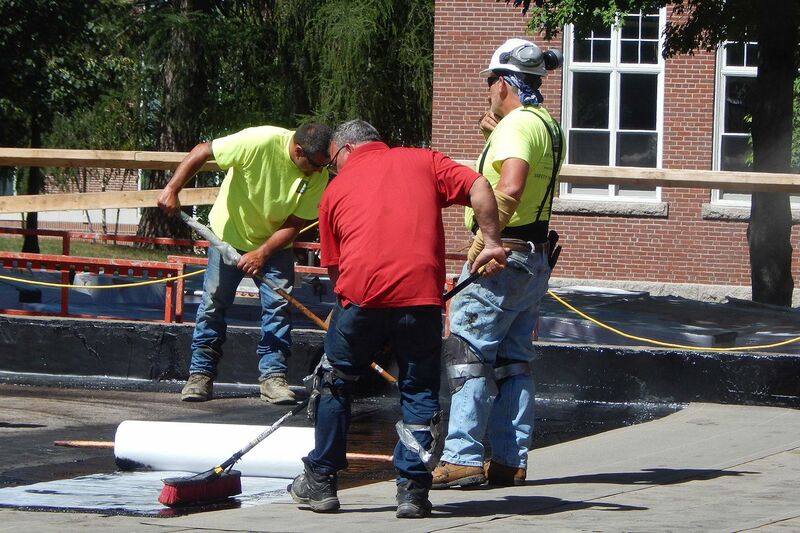 While, acting on its haunches, Sundown was placing new concrete in front of Coram, a half-dozen or so workers for Contracting Specialists Inc. were around back finishing up the new waterproof membrane on the 45-year-old concrete deck between Coram and Ladd libraries. This is the centerpiece of the entire Ladd Plaza renovation taking place this summer, as the original waterproofing was worn out and water was leaking into the library spaces under the terrace. Begun last week, the process resembled sealcoating a driveway: pouring hot asphalt (a special rubberized product) out of 5-gallon buckets and spreading it with brooms and squeegees. It looked like hot, heavy, and fumey work. In the completed areas, a second layer of material had been laid, thick sheets of a protective asphalt fabric. The next step, Farnsworth explained, will be the installation of another waterproofing measure, metal flashing, around all the ground-level brickwork. That will even entail the removal of exterior doors so that flashing can be run right into the entryways. Water-tightness being the raison-d’être of hot-applied rubberized asphalt, how do you test it, short of waiting for rain? One key to quality control is the discerning gaze of the project manager while the membrane is being placed. More quantifiable is a process is called vector-field mapping, which capitalizes on water’s electrical conductivity: The waterproof surface is moistened, sensors carefully strewn around, a pulsating electrical field created — and wherever pulses are detected where they shouldn’t be, you have a leak. Pipe Dreams: The replacement and expansion of the hot-water system in Carnegie Science Hall has resumed after a brief scheduled pause. 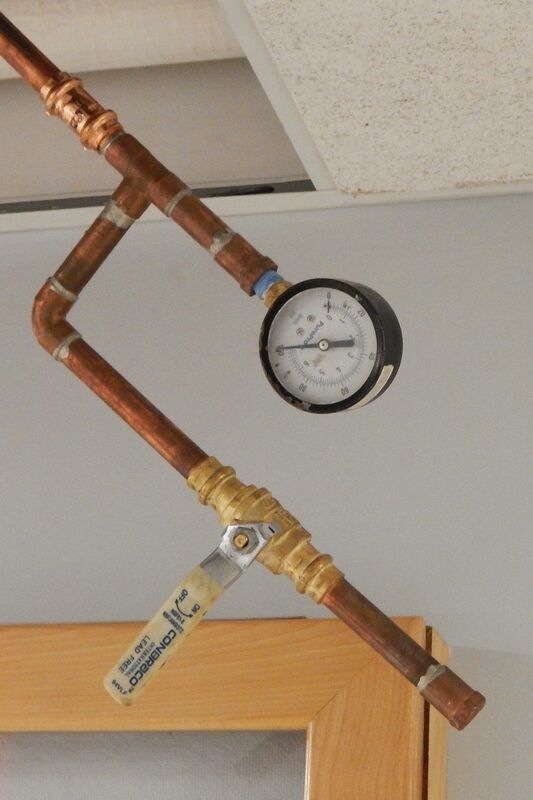 The building’s original source-to-spigot arrangement is being replaced with a circulating loop that will deliver hot water to users much more quickly. At the same time, all the original supply pipes, which are becoming leaky, are being replaced. In the capable hands of Damon Mechanical, the work was completed from the basement up through the third floor. 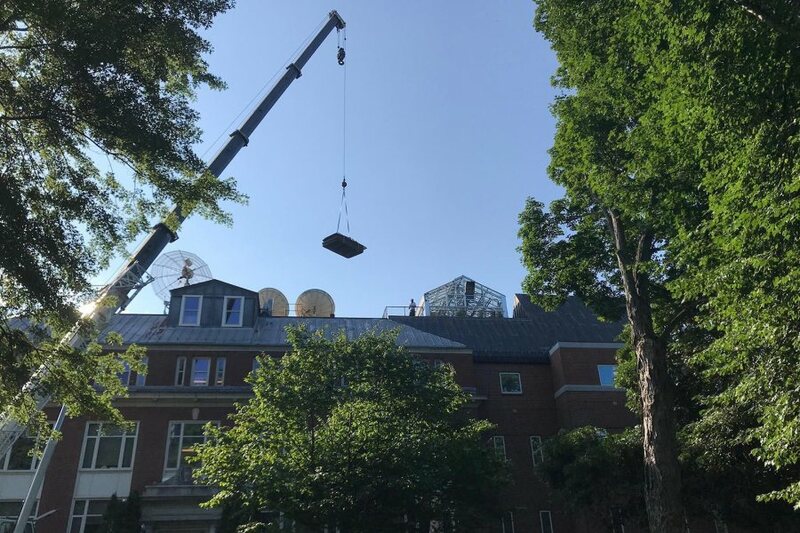 At that point, a time-out was called so that Bates scientists and their students on floors four and five could bring their research to a good stopping point, explains Alan Kelley, who is managing the project for Facility Services. That’s because the installation comes with ruckus, which doesn’t mix well with scientific research involving delicate equipment, test animals, and mental focus. “We really had to be careful around the fourth and fifth floors from the start” of the project in mid-June, says Kelley, manager of electrical and mechanical services at Bates. Kelley is also overseeing the overhaul of underground utilities serving Smith and Adams halls and the Olin Arts Center. 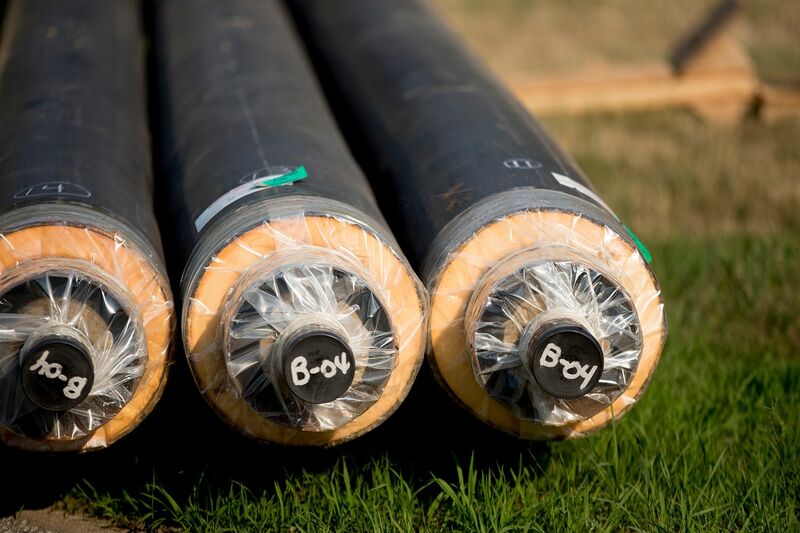 As this is written, the water mains have been replaced and new fiberglass liners inserted into old clay sewer pipes, so those of you following along at home can check those off your list. 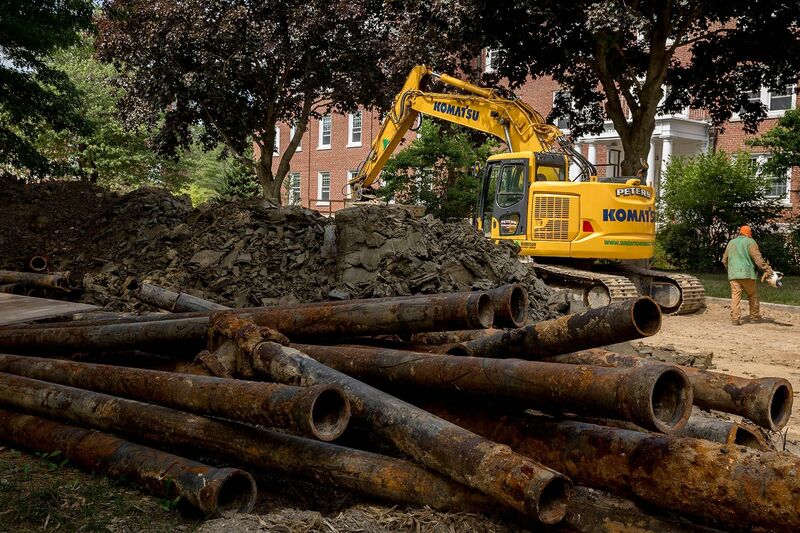 The third phase of the surgery on North Bardwell Street is the replacement of pipes that conduct steam from the central steam plant around campus to heat buildings — but that undertaking has hit a glitch. In front of Wentworth Adams Hall, Kelley explains, “we ran into a conflict with a communications duct bank” — a bundle of conduits for phone and data lines — “that’s in the way of where the steam line was going to go. “As a result, we are actually redesigning the direction of the pipe. We were planning to go straight up the street and then turn and connect to a steam vault” near Olin. In the new alignment, the pipeline will zig under Adams’ front lawn, zag along Adams’ foundation, and thence head to the vault (a concrete box providing access to crucial underground junctures). So while North Bardwell will be open by start of school — with a base coat of pavement — and steam will be flowing by start of winter, one more excavation will be needed to finish the steam work. That could push the final paving of North Bardwell into fall or even into next spring. Done and (Nearly) Done: The installation of a railing across the front of the Alumni Gym stage was the final touch in the renewal of the 1926 gym’s floor and seating. 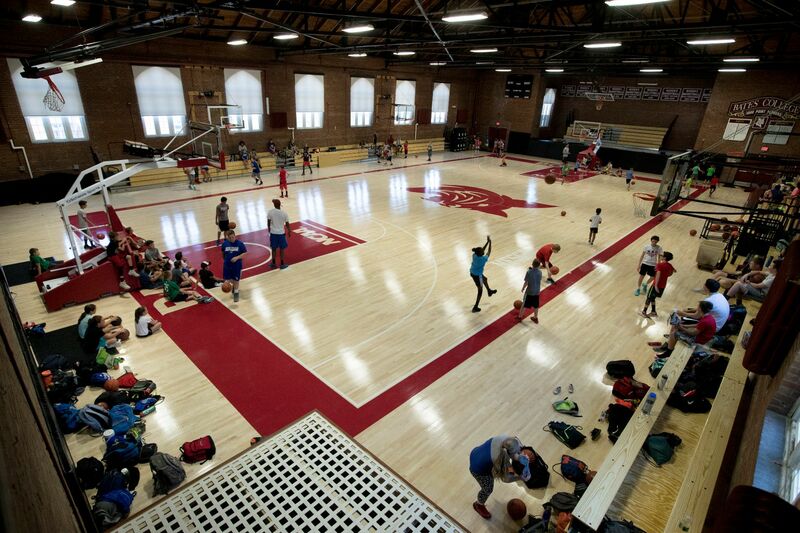 That took place in late June, around the same time the gym was seeing its first hoops action after the rehab — a summer basketball camp featuring a number of alumni standouts as coaches. The gym is being used into early August by the Bates Dance Festival, which has laid two layers of protection atop the shiny new floor: a rubber mat and a so-called Marley floor, a roll-up vinyl covering commonly used to create temporary dance surfaces. 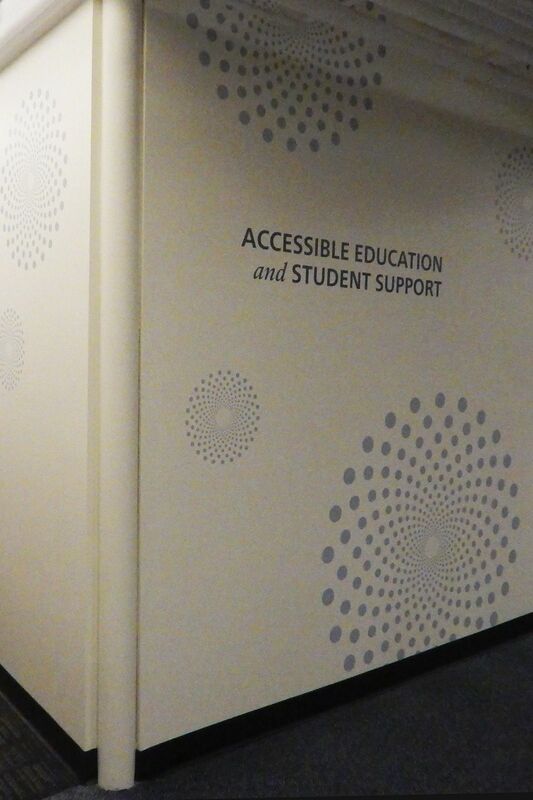 Meanwhile, back in Ladd Library, the new home of Accessible Education and Student Support is all but ready for occupancy. The last construction was the installation of doors and other finish items early this month. Red Thread brought in the furniture last week. In fact, AESS director Abigail Nelson has moved in, with her two colleagues to join her by September. So what’s left to be done in this snug warren of offices on Ladd’s ground floor? Touching up the white-and-blue paintwork, carpeting an access ramp, and putting railings across window openings that, when this was the ground floor of the 1949 Coram Library addition, admitted daylight. Now they afford a view of the stacks and study areas on the ground floor of Ladd. Can we talk? Send your questions and comments about past, current, and future construction at Bates to Doug Hubley. Good cake recipes are welcome, too — and in turn, may we recommend King Arthur Flour’s Original Cake Pan Cake? Please put “Construction Update” or “Cake Recipe” in the subject line. 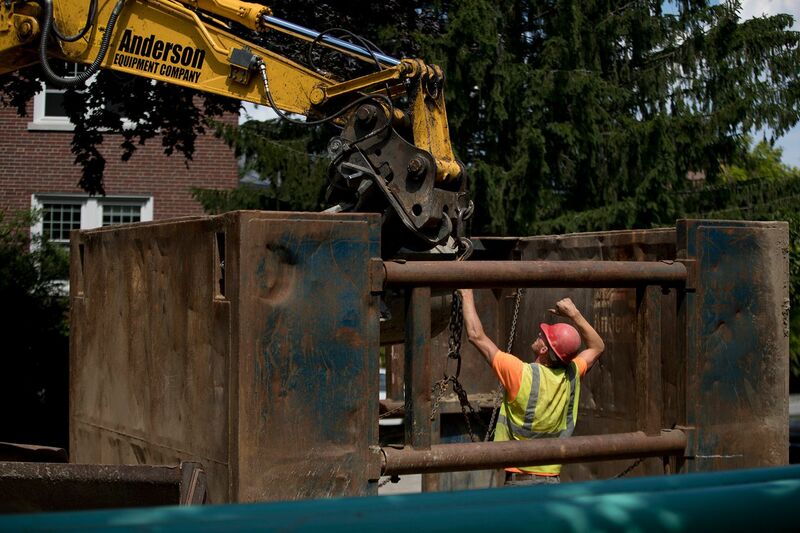 Campus Construction Update returns on July 27.